Information on how to get a visa in Germany as an American. Whether it's the Language or Artist Visa, getting residency in Germany is the first step. Okay, I’ve put this off long enough…. Here’s the story on how I got residency in Germany as an American (U.S.) citizen and what I learned about trying to get the freelance / self-employment / “artist” visa & work permit. It’s been a frequently asked question for a while now and I haven’t put all the information in one place yet. So if you’re planning to move to Berlin and/or Germany for the summer and/or long-term for work, this guide is for you! So you want to live in Germany? Luckily as an American it’s possible to get a visa while in Germany with relative ease. There aren’t many places in Europe that allow Americans to get residency and the ability to work, but Germany for some reason allows it. There are two basic things needed for just about any visa in Germany—proof of health insurance and a registration card showing your German address. Register at a Burgeramt to get an official declaration of your German address called an Anmeldebestätigung. This should be done within a week of moving into a permanent (or semi-permanent) residence in any German town. Though I’ve admittedly done this up to a month after moving into an apartment—just be prepared for a nasty look and an extra-harsh grilling by the official (often only in German). Get health insurance with a German provider. You will only be issued a visa with proof of health insurance—and it absolutely must be by a German provider. It doesn’t matter if your American or international insurance covers you in Germany, you will need a German one. Personally, I use TK—German’s national provider. View their website in English. To get a visa in Germany as an American, you basically have two options: the student (“language course”) visa and the self-employment (“artist”) visa. I’ve personally known several people who’ve gotten one or the other visa. As an American, they’re not so difficult to get and they allow you to live in Germany for longer than any Schengen visa. A residence permit in Germany will of course give you the eligibility to travel around Europe longer than any Schengen visa as well. For official information on getting residency in Germany, and to make an appointment at the Berlin Ausländerbehörde (Foreigner’s Office) to get a visa, check out Berlin’s English-language Ausländer website. Getting an appointment at the Auländerbehörde can take a while—you may not see an opening for months (yes…months). In Berlin, they have walk-in hours but it’s absolutely necessary to go as early as possible—before the Ausländerbehörde even opens. Visiting the Ausländerbehörde to get information on the visas is advisable as early as possible. I also recommend bringing a German speaker (preferably native) along with you as it makes the process that much simpler. What is the language visa? With the language visa you’re not eligible to work or make an income while living in Germany. However, I have heard the odd story of people working under the table here in Berlin. Even in semi-professional career-type jobs at startups for example. If you want to legally work and live in Germany, you should consider the self-employment (“artist”) visa. What is the artist visa? 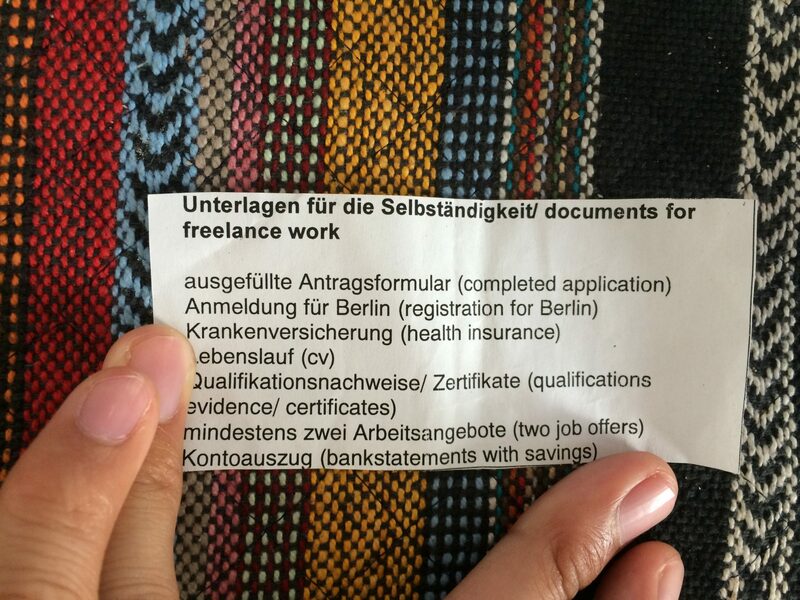 It’s quite common to find Americans living and working in Berlin—usually here on the freelance/self-employment/artist visa. It’s essentially a work permit but doesn’t necessarily have to be tied to a particular job or company. This is unusual for most European countries which often only allow the eligibility to work if you’ve already got a job and contract lined up. A lot of the information that you need for the freelance visa (also called the “artist” visa) can be found on this extremely informative tumblr: 4 day visa. While I think the info on getting a visa in Germany on that site is simplified quite a bit, it’s still one of the most comprehensive guides to getting residency in Germany. It’s just a bit optimistic in the time-frame! Four days? It took me nearly seven months…. I’d also recommend a lot of patience. I’ve known some people who have gone in and come out with the visa in the same day. However, I’ve also known fellow Americans in Berlin to wait months (myself included) for a visa. In fact, I was given temporary residency TWICE while my visa was pending. In the end, I received a work permit tied to a particular job with the ability to also do freelance work. View the full Berlin travel archives here. Includes travel photos and essays about living in Berlin. Looking for a job elsewhere? Be sure to read this post about how to find a job in Europe on Nicole is the New Black. Sign up for the monthly newsletter for more travel and expat stories from Berlin & beyond. thanks for the wealth of info~ ! just wondering if you if you know if Care Concept is still an accepted insurance plan in support of visa in the eyes of the auslanderbahorde? Hi Adam, thanks a lot for all this information! 1. I have my Deutschkurs Visa right now, I got it for 5 months. I am a graphic designer so I intend to stay longer and get a job. In the meantime, I plan to switch from my Student Visa to the Freelance Visa. Do you know the requirements to switch Visas? 2. Do you know if I am allowed to work at a Physical Company here in Germany while having the freelancer visa? I don’t know the specific answers to your questions but I do know that once you switch away from the Student Language Visa, you can’t apply for it again. Over the weekend I met the folks from Expath.de who specialize in answering these types of questions. I highly recommend you get in touch with them. Consulting fees seemed pretty cheap at 1 euro/minute. If you do contact them, please tell them you came from this blog. Viel Gluck! Any idea, how long I’m allowed out of the country on a Artist VISA in berlin? I have some family matters to attend back in Australia and don’t want to be surprised when I return, getting stopped at the border cause I’ve been out of the country to long even though the VISA is still valid. Can’t find anything that officially states the rules on that. Not sure of any official rules but in my own experience I left Germany for about 7 weeks to go home to the USA last year and didn’t have any trouble at immigration. I won’t lie that I was worried though! I work remotely, full time as an independent contractor for a U.S. company and my check is deposited in a U.S. bank account. If I want to live in Germany and continue doing my job do I even need a work permit? I know I’ll need a residence permit, German health insurance and to pay German taxes… but is any type of work permit required? I’m not an immigration expert, but as I understand it, you would still need a work permit. If you’re living in Germany and using German resources, they expect you to pay taxes there. But, like I said, I’m not an expert. That’s just my understanding. Jared, I have the same situation as you and wondering if you found out any information. Hey there, so i received a 3 month Fiktionsbescheinigung extension after my visit and was told that the photography freelance visa is not the same as the freelance artist one, and so they had to send my portfolio to be approved; but I haven’t received any notification in the mail regarding their decision to extend it (I went there August 26th); but I have booked an appointment for the end of this month to go back to Ausländerbehörde in case they don’t grant me the 1 year visa … but I wonder if they’ll send me away if I haven’t received the letter in the mail by the time of my appointment and say that I will need to wait on the decision first in the mail and then return back to the office … Any ideas about this? Thanks! My file and CV/portfolio had to be sent to another office to be reviewed as well. It took nearly four months until when it was sent off to when I got approved. I think it’s probably a good idea to go back for your next appointment just to follow up (I did something similar). They’ll just tell you to keep waiting and you’ll hear from them as soon as they make a decision, but it helps a lot to keep reminding them! Hi Adam! Thanks for this great post. I hope I’ll be able to make a similar post on my blog in the near future. :) Until then I have a couple questions for you. I’m coming to Switzerland on a tourist visa with the intention of trying to get a German freelancer visa while I’m there so that I can stay longer to live/work there. As I was reading the info I got a bit confused. Does this visa require that your residence is in BERLIN? I have connections to a residency in another part of Germany. Furthermore, while I would use that address as my residence I would actually reside in Basel. Do you think there is anything I need to worry about in that regard? I can’t imagine they would find that out in some way. My second question is about the 3 contracts. Do you think that the amount of money the contracts are for would make a difference? Also, does showing them bank account records help? I have quite a bit of savings…more than enough for a year of living and since I will be leaving a full-time job here I’m not sure what kind of contracts I will have once I get over there since I’m just reimmursing myself back into the freelance world. I have a few things in the works now but they will probably be complete by the time I get there in November. How do they even verify these contracts? What type of information needs to be on them to make them official? Thanks for all the information. Other sites made it sound like you just show a few documents and leave with a visa. Yours seems to be the more realistic case I would think. 1. You have to prove residency in Germany. This is done with the Anmeldebestätigung. 2. Personally I don’t think they would easily learn about your actual residence being outside of Germany but bear in mind that you still have to pay taxes in Germany, etc etc. 3. I do think you need to prove a livable income for the visa. Showing bank statements certainly can’t hurt. I did the same. As far as I know they don’t even verify the contracts. I simply provided invoices which included business names, contact details and details of the transaction. They were short and simple and could have been easily faked. Thanks so much! Sounds promising then. I made an appointment online already and I think I can provide all of the requirements. I figured I will have to pay taxes in Germany but I haven’t looked that far into the details yet. Also will have to use doctors in Germany but its not a big deal since I’ll be in Basel right on the border. Thanks again for sharing this info. Happy Travels! Thanks for an interesting article. My husband is a musician, and we would love to live in Germany, but thought it would be nigh-impossible. I was worried about the same things – putting money up front and what would happen if I didn’t get the visa? Turned out to be needless worry because it’s fairly common and easy to get a temporary visa status while they consider your application. I only provided an English version of my CV. I’ve heard others that were requested to provide a translation, though, so it doesn’t seem like there’s a hard and fast rule on this one. Adam, you are so cool. Thanks again for all the info! Looks like I’ll have a couple visa choices for when I make my move in January :) Take care! Some will speak some English, but I wouldn’t rely upon it. And I’d definitely bring a German-speaker with you if you can. Hey. Thanks for this post. I’d posted a few comments to Nicole’s “Living in Germany…” post, and she’d referred me to this post. I’ve found it extremely informative. Yet still, I’ve a few questions. 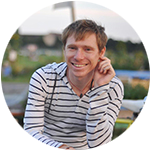 What’s a realistic, minimum, all-inclusive rent for a private flat in Berlin, what’s the best route to secure such a rental? Also, I possess an unstamped US passport, which I had issued in ’04, in the Czech Republic (which I’ve not left since then). Do you think that this may be problematic in entering Germany from Czech, or applying for a German artist visa? Nicole’s post is great, isn’t it? A realistic, minimum, all-inclusive rent for a 1-bedroom flat: expect 450€ if you want a place in or near the popular areas of Berlin. You can pay as little as 300€ all-inclusive on or outside of the ring-bahn for a 1-bedroom. Can’t help with the passport info. Try contacting the US Embassy in Berlin directly, but I don’t see how or why it would make a difference. A passport is a passport, isn’t it? Hey. Thanks for your prompt reply. For the last 2-3 weeks, I’ve been thoroughly researching Berlin rental agency websites, yet the lowest rent I’ve found is 350 EUR for a studio in Spandau. Do you know of any better route/s to secure a 300 EUR rental? Also, I’ve been inquiring about this in Prague, and some one gave me the name of a squat in Mitte: “Schokoladen”. Do you know anything about this? Hey, Sorry but can’t really help you. It’s really a hit-or-miss type of thing. Many of the apartments I’ve found to live in were because I met the people. Don’t know anything about getting into squats, either. Good luck! I discovered you through Flanders is a Festival (are you going to any of these? I will be at 2) and found we both live in Berlin. Awesome! I like how you made this FAQ here, because I have found myself writing exhausting emails to other Americans moving here with step by step tips on how to get a visa, based on my trial and error. It’s smart of you to have a page here to just direct people too, though. A few things about the language visa: it does grant work permission. I got a two-year visa given to me and with it I’m allowed to work 90 full days or 180 half days in a year… basically that’s 5.5 months worth of working days… just wanted to add that in. Also, I am a freelancer but serious about learning German, however when they found out I have freelance work but was applying as a student, there was trouble. So it’s totally possible to work (either an American job or under the table) but applicants should not mention this, nor can they rely on funding from those jobs as proof of having enough money (the 8000 ish euros required to be in the bank for a student visa). Hopefully this information will help your readers. Also, I pay 26 euros a month for ex-pat insurance as a student through Care Concept AG. It isn’t great for long-term but for a couple years, absolutely. It’s the most basic plan so it doesn’t cover dentists or eye doctors, but I have been to general practitioners and specialists and my insurance covers the cost of these visits for me. Yep – I’m going to Flanders is a Festival this upcoming weekend! Writing this was really useful because I found myself answering the same questions over and over. Interesting to hear your experience with the student visa—I didn’t know you were allowed to work at all with it. I do believe you that you shouldn’t mention doing work if you’re applying for a student language visa. Even though there’s this urge to tell the complete truth, it often complicates things! And I’m totally jealous of your insurance plan—had no idea it could be so cheap! Well maybe if jobless people move to Berlin the rents will still be low by the time I try to get my masters there as a German affairs student (rather than as a hipster). Probably not though. I showed up without and\ appointment and was seen within an hour. I was applying for the Artist/Freelance visa and I brought as much paperwork as I could (the stuff Adam recommended and some extras). However, I didn’t have a bank statement or any contracts…BOTH of which are required. On the bright side they gladly gave me a 3-month visa to get my paperwork together. I’ll report back when I apply again. Thanks for sharing your experience Brian! I got the same 3-month temporary visa twice while my case was being considered. Glad to hear it’s been easy for you so far. “Visa” is one of the ugliest words in the English language in my opinion. Way to break it down plain and simple. I just sent off my papers to try and get my residence permit here in Sweden extended and I am stressed/curious how it is going to turn out. I have heard mixed things on how easy it is for them to grant extensions (it was easy to get one in the first place because I was studying) so if it turn out unsuccessful, looks like I am heading to Berlin! I have a quick question for you. The official visa site states “A residence permit can be issued to a foreigner for practicing a self-employed occupation if there is an overriding economic interest or a special regional need.” and you say that we need “Minimum of 3 freelance contracts for future work (recommended to have these in German, but I only ever submitted English copies)”. Do I need to have contracts (even fake ones) lined up in Germany/Berlin or can they be for clients in the US? I showed one contract from a client in Berlin, the others were international (Europe and America). My guess is having a local contract certainly helps, but I’m not sure if it’s completely necessary. You mentioned the visa is good one year, and sometimes two years. Do you know if there is a limit on how many times you can renew? Also, any ballpark idea on how much health coverage runs? I looked at the site, but didn’t have much luck finding numbers. Hi Ann!!! Glad you guys are talking now with Adam and you made it to his blog. It’s awesome isn’t it? I have a similar question regarding the health insurance actually. @Adam, could you recommend something to us? Not sure of a limit, but when I originally researched it, I was fairly certain it’s just a 1 year visa with the ability to renew for a 2nd year. I was able to initially get a 2 year visa because it was tied to my job at the time when I applied. Health care can be pretty steep. I’ve heard of people paying as little as 90€ per month, but realistically I pay 200+€ per month. There is another healthcare option that’s very popular with freelancers, but I don’t remember the name…. Adam!!! I am so glad you finally posted this. Seriously I think you are one of the most generous and coolest hipsters I know! Period!!! Now I was wondering what you mean by this “Getting an appointment at the Auländerbehörde can take a while—you may not see an opening for months (yes…months).”? Do you mean it mght take months to get the visa itself or even just an informational interview at that office? Another question is would you advice getting an appointment with the consulate officer while still in US and which questions to ask from your experience? I am debating whether to go to the one in DC, but not sure what good questions to ask. 1. When you schedule an appointment, there might not be any available slots for weeks or even months—so plan early! 2. I only ever applied for a German visa while here in Germany. It’s possible the German consulate could give you additional information. Never could hurt to ask questions directly! You may even be able to apply for the visa while outside the country, which might make things easier. Dang, you have to show a portfolio? Must get to work…. Hey Christy, Anything that helps to prove your skill is recommended! Adam this is gold. I wonder though – is a blogger counted as an artist?? First of all—you’re definitely an artist! Second, it’s commonly called the artist visa because it was initially started to help architects and other creative professionals work temporarily in Germany. But essentially it’s a self-employment visa so you just have to show you can make money. If you have a business plan or any other sort of documentations proving your business, then it’s useful to include. Thanks for posting this. Will come in very handy when we finally hit Europe. I’m excited to hear your stories from Europe! It takes some effort to get this visa but hopefully it’ll help you out. This is a great post as my partner is German and the game plan is to go back there to live at some point. How long does the artist visa allow you to stay, though? Ah! Forgot to include that – The artist visa is typically a one year visa with the option to renew for a second year. You may also be able to get the full two years right off the bat, though. Adam you’re the man! Really, really informative post and THE ONLY comprehensive one on this topic out there. Thanks! No problem Brian! Hope it’s useful and you’re able to get it all sorted out. Good luck! Thanks for this Adam! Such great info! Fingers crossed this works for me! Good luck, Alexandra. Make sure you bring a native German speaker with you—it’ll make it so much easier!